8 entries categorized "Stories from my past"
When I was attending college on Long Island (New York), I went to summer school to catch up on a couple of prerequisites for my new major. While I was there, the Clyde Beatty-Cole Brothers Circus set up their tent on the campus and stayed for three days. During that time, I met and became friends with some of the men and women who worked for the circus and I ended up visiting them several times when the circus was in the area during the next few weeks. My circus friends loved it when I was around because they were typically in each town for just one day. To have a non-circus visitor whom they saw more than once was very special for them. 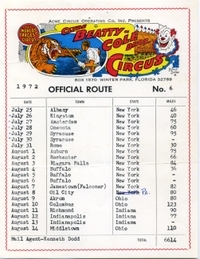 To my delight, they invited me to travel with the circus for a while and I ended up staying with them for five days on the road, going from Kingston, NY to Syracuse, NY. My parents, of course, had visions of acrobats dragging me behind the bushes and having their way with me, but in fact, I was treated like a princess. Everyone went out of their way to make my time with them a lot of fun. The circus' manager took me on a VIP tour of the sideshow tent, so I could talk to the performers and see how some of the tricks were done. When I would sit through the performance, the vendors would "force" me to take free snocones and drinks, to the annoyance of the other audience members, who were paying a lot for the same items. I even had personal encounters with some of the animals, thanks to their trainers. The clowns, who I'd been told were all quite gay, were some of the most interesting people I've ever met. The last night I was with them in Syracuse, the group rented a hotel room and threw a going away party for me. Everyone was there, including the "24 hour advance" man, who I hadn't met because he was always a day ahead of us on the road. A year later, I was taking summer classes again when the circus returned to the campus. I went to the performance and was recognized by several of the people, including the new circus manager, who had been the advance man the year before. I was invited back to his office (on a truck) afterwards to talk, but the word got around that I was there, so a number of my old friends stopped by to say hello to me. That was the last time I ever saw those circus people, but I will always remember their kindness and friendship the summer I ran away with the circus. Lady Bird Johnson passed away recently. She was the wife of Lyndon Johnson, the U.S. president during the 1960s. While she lived in the White house, she worked tirelessly to beautify the American landscape. To help her with this mission, she formed the First Lady's Committee for a More Beautiful Capital, a group of about 20 people that included Laurance Rockefeller, Stewart Udall, Walter Washington and Mary Lasker. One of the other members of that committee was my father, Adam Rumoshosky. 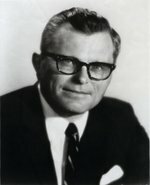 At the time, he was the Director of Marketing for the American Petroleum Institute. Lady Bird eventually left the White House, but my father remained in touch with her and deeply involved in beautification efforts. After he retired and my parents moved to South Carolina, he founded the Keep Oconee Beautiful organization. He was incredibly proud that he never missed a single meeting in the 20+ years he was involved with that group, until age and health made him quit. He didn't limit himself just to group projects, but would often grab a plastic bag and clean up litter on the roadside or plant community flower gardens. My father died in May at the age of 92, not long before his old friend, Lady Bird. In his whole life, except for the time that he was Arnold Palmer's golf partner, he was probably proudest of the work he did for beautification. He may not have been an artist, but he and Lady Bird both brought a lot of beauty into the world in their own way. How nice it is that we, as artists, have such a great opportunity to give this gift with every single thing we make. Let's not waste it. I missed my big high school reunion this weekend. I even helped a lot with the planning, creating a small website to centralize the reunion information, but I was not able to attend. However, during the planning, I had the opportunity to rediscover many old friends and learn what a wonderful group of people I grew up with. The last time I saw these folks, we were all teenagers and not in our right minds. Now they have magically transformed into the nicest, most talented people and I am so privileged to have had a chance to reconnect with them. This afternoon, my friend Toby performed with her band at the picnic by the river. 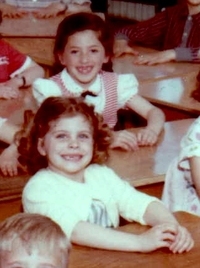 Here's a picture of Toby (in the red) and me when our allowances were so small that we couldn't afford teeth. 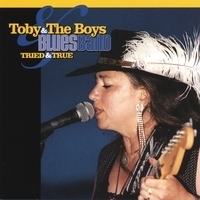 These days, she fronts a hard-driving blues band, usually performing on Long Island, NY. When we were seniors in high school, three of us performed a very pretty Jamaican folk song, popularized by Joan Baez, during the high school's Spring Concert. Toby played the guitar, Gail and I sang along with her and we all wore elephant leg pants. We were three smokin' hot folksingers. We made sure all the kids in the chorus knew the story, but Mr. Robinson, that dear man, never figured it out. It all started on a beautiful day in the middle of last summer. My husband had worked in the hot sun for many days, relandscaping the garden along the road. 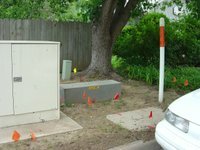 While he was working there, a representative from the phone company stopped by to say that they would be doing a little work on the small utility box in the corner of that garden, however they would be running the cables from the west and the disturbance to our property would be minor. Soon after, a hundred colorful flags happily appeared in our front and side yards, waving in the wind and marking the utility lines that ran along the road. For months, we enjoyed mowing around those flags, watching them get rusty and gain character as they weathered. The kids next door would occasionally play with them or pull them up as they waited for the school bus. That was fine, because we knew we could grow more. We patiently waited for the recabling work to start. Autumn came and a woman planted more flags in the same spot, perhaps as decorations for the upcoming holidays. By then, the leaves were falling and we had lots of fun raking around them, playing "Avoid the Flag". We continued to wait. By late November, when our flags were in various states of decay, a familiar looking woman let herself into our back yard, blessing us with a new crop of flags in front of our back fence. We sat and waited some more. The whole region suffered through a terrible ice storm in January. The ice was a couple of inches thick and stuck around for weeks. Our dedicated phone company apparently intended to dig through the ice to lay the cables in the frozen ground because the lady returned to spray paint flourescent orange lines across the sheets of ice in the back yard. Unfortunately, the ice melted several days later and the lines disappeared. In February, the work finally started. Our landscaping disappeared under the treads of a large dirt grader, then they prepared to pour several large concrete slabs. This was not the little recabling job that we'd been promised, obviously. My husband called the company and told them the concrete forms were incredibly crooked in comparison to the curb and fence, requiring an adjustment. After several lively discussions, the forms were rebuilt in May and the boxes installed. To this day, the work continues, as they clean up loose ends, fill in the deep holes they left, dig up the holes again to fix the pipes they broke, then fill the holes again. It's been a long effort, but what wonderful results. 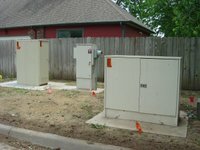 We are now the proud guardians of three new utility boxes, a warning pole and an in-ground access panel, all now restored to their original environment on the Kansas prairie. Notice the flags, which have reseeded themselves and will grace the landscaping for years to come. We are also treated to the loud roaring of the cheap fan inside the largest and closest box, providing an aural ambience that can drown out the roaring of the Kansas wind. On Wednesday, I plan to celebrate Independence Day by plucking the oldest, most beautiful utility flag from our yard and waving it proudly. In case freedom rings and we're not home, I hope it leaves a message on the answering machine. 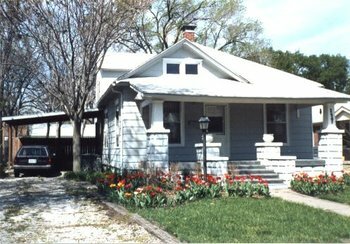 In 1985, I was newly single and looking for a house to buy in Wichita. One house I looked at was in a lovely area that was only a three minute drive from my place of work. The owner was a tall, bearded man in his 30s, who worked for the fire department and was also a musician. As I walked around the house, looking it over, he sat in the living room and played the banjo for me. I ended up buying the house and, in the days before I moved in, I wrote a song. "He's the spirit of the house. He lived there once, you know. Since then folks been telling tales about that old banjo." Several years later, I remarried and we bought another place. I put this house on the market, for sale by owner. The ad I wrote had been printed in the paper for several days when, one morning, the phone woke me at 7 am. It was a local radio DJ. The day before, he and his partner had discovered my ad in the paper and were so intrigued by it that they had talked about it all morning on their show. They ended up interviewing me over the phone and played the taped interview on the air later that morning. Right after the aired tape ended, they received a call from a certain fireman, who told them he was the Spirit of the Banjo House. The DJ's female partner actually came over to see the Banjo House one day. The radio station wanted to do a remote broadcast from the house, but I'd already had the telephone disconnected, which they would have needed. So much for my house's 15 minutes of fame. When I showed the house to prospective buyers and they toured the rooms, I played my 1923 player piano, to give them the same kind of wonderful experience I'd had. 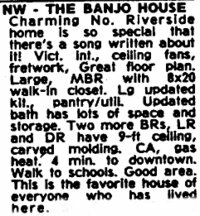 A young couple bought the house and I've always wondered if they ever heard a banjo playing faintly in the living room. By the time I was 10 years old, I knew what I wanted to be when I grew up. I wanted to be a scientist, an artist and a singer like Eydie Gorme. As it turned out, Eydie had nothing to worry about, but I've done the other two. When I was in 8th Grade, I thought science was cool, so my parents gave me a nice coffee table book for Christmas in order to further my science education. It didn't, but reading hundreds of science fiction books did. By the time I got to high school, I thought I'd be a fashion designer instead. I had sewn my own clothes since 7th Grade and thought it sounded like a fun job. Towards the end of my Junior year, my mother learned about a special summer program at Parsons School of Design that introduced high schoolers to different art specialties, such as painting, sculpture, commercial design and fashion design. That seemed like a good way to explore a potential career, so for six weeks I travelled to NYC on weekdays and attended the course with my friend, Toby. In the end, I learned that fashion design was a highly competitive field and you needed a lot of talent and drive to succeed, neither of which I had in any great amounts. To prove my point, here's a picture of me from around that time, dressed in my favorite vest and skirt, both which I made myself. I'm certain that this outfit still exists somewhere, totally intact, buried deep in a landfill. The fabric was actually plastic vinyl that was printed to look like leather. Dig it up, hose it off and someone could probably wear it again. Outside of my high school art classes, that was the first and last time I studied art. I ultimately worked in science and technology related jobs for many years. I began quilting in 1993, which was the trigger which started my journey as an artist. I'm rather amazed that my career has come full circle and I'm finally working as an artist as I had originally planned. I may not be a fashion designer, but I am working with textiles. The whole idea of being a fiber artist did not exist back when I attended Parsons, so I'm fortunate that the art world has matured to the point where work like mine is now included and accepted. My birthday was Tuesday and this may be a little late, but let me tell you how I was born. My mother, Marguerite, went into labor in the middle of the night. After several hours, she finally woke her husband, Adam, to tell him it was time. Apparently, she didn't know that a second child often arrives faster than the first, so she took her time, showing Adam how to cook the casseroles in the freezer and the proper way to run the washing machine. Neighbors arrived to watch two year old Tim. The husband, who was an opthamologist, got on the phone with the obstetrician and told him he may need to deliver the baby right there. The obstetrician said this was not the neighbor's specialty and to send Marguerite to the hospital, so she was loaded into the back seat of the family car, a two-door sedan. Adam drove north on Broadway, speeding as fast as he could, headed towards the maternity hospital in Tarrytown. Marguerite screamed from the back seat all the way. When they arrived, Adam pulled into the parking lot, parked the car and ran through the front door. It was 5:30 am and a very bored nurse was sitting by herself at the reception desk, reading a magazine. Adam yelled that his wife was inside a car in the parking lot, having a baby. Without even looking up, the nurse said, "Go around to the Emergency Room entrance in the back". Adam ran back to the car, but as he got closer, he realized Marguerite was talking to someone. Yes, it was me! Here's a picture of the first thing I ever saw, the dashboard of a 1946 DeSoto Club Coupe. Adam went running back into the hospital and yelled to the nurse, "The baby's HERE!". The magazine and the nurse went flying. In just a few minutes, hospital staff members were gathered around the car, trying to maneuver Marguerite (and baby me) past the folded-down front seat. Later, Adam learned that the obstetrician had stopped for coffee and donuts on the way to the hospital, thinking that everyone had been overreacting a bit and there was plenty of time. Even though he missed the birth, he sent my parents a bill. This is one of my favorite pictures of me, taken at my grandfather's house in Poquannock Bridge, CT. In the background, you can see the famous DeSoto. For as long as we owned this car, my mother called me her "backseat girl". I grew up in a wonderful Victorian house in Dobbs Ferry, NY. The house, called Stables Gables, was originally the carriage house for the large mansion next door, a massive house with three foot thick granite walls. In the 1890s, the stables were torn down and this house was built on the foundation. On the other side of the yard, they built a two-car garage that has a servant's apartment on the second floor. If you look at the biography on my website, you'll see a picture of me standing in front of this door in my Easter dress. My parents sold this house and moved to South Carolina when my father retired and I was 29. 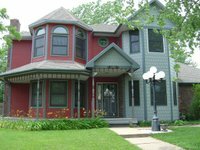 Fast forward many years and I'm still living in a wonderful Victorian house, only this one was built about 25 years ago and is located in Wichita, Kansas. We've lived here for 18 years and my husband is currently doing a lot of work on it, which is why there isn't a railing on the new front porch yet. Our house doesn't look like the one-story ranch houses in the rest of the neighborhood, so little kids are totally in awe of this place. On Halloween, little brides and monsters tell me that my house looks like a fairy tale castle. Yes, I think it does, too. It even has a wishing well in the corner of the front yard. Someday, I'll tell you about the Banjo House.